Welcome to my review of the Bushnell Legend Ultra HD Monocular. This monocular is a 10X piece of glass with a 42mm objective lens, and is designed with ergonomics and tactical use in mind. The monocular sports a Picatinny rail for mounting accessories, and is tripod-compatible. How well does it perform, though? You get everything you need to get started, without any extra pieces to get lost. The tripod mount is built right into the monocular, so there’s no need for an adapter if you want to mount the monoc to a tripod. The tripod mount socket is removable, if you want to remove it, as is the belt clip. The only flaw I’ve been able to find with the Bushnell Legend Ultra HD is the carrying case; unless you have something else to store in the pouch, the pouch is vastly oversized and the monocular bounces around a bit. I only use the pouch to store the monocular when it’s not in use; when I’m carrying it, I either carry it with the neck strap or using the belt clip. This monocular provides 10X worth of magnification, and the resolution at long distances is stunning. You can focus in on nearly invisible power lines from a mile or more away, and see fantastic detail even in the shadows of trees and tall grass. Bushnell has designed the Legend Ultra HD with BaK-4 roof prisms, which provide amazing optical clarity even when focusing on objects more than a mile away. The lenses are fully multi-coated, which helps to prevent fogging and glare. To make the lenses even more useful in inclement weather, Bushnell has also applied their RainGuard HD coating to the lenses. This coating provides permanent water-repellent capabilities to the lenses, causing moisture from rain, snow, sleet, or other forms of condensation to bead up and scatter less light, leaving you with a clear, bright view even in the poorest weather conditions. Other buyers of this monocular seem to have had a similar experience so make sure to see what they have to say. The ED Prime glass helps reduce color dispersion, so you can make out fantastic color detail even at the longest range of the monocular. The eye relief is a comfortable 15.2mm, and the eyecup is a twist-up design for use with or without eyeglasses. Close focus range is as near as 6.5′, which means I can read the fine print on my ammo boxes from across the room! The 42mm objective lens provides ample light transmission, so the monocular is equally at home in broad daylight or low light conditions. I’ve used this monocular during high noon sightseeing trips to view wildlife and birds, and I’ve also used it at night to view the moon and the stars. It’s obviously no replacement for a full-on telescope, but I was able to get some pretty decent views of the moon, Mars, and various bright stars through the monocular. Next up is field of view. The FoV on this monocular is amazing, providing you with 340 feet of view from 1,000 yards. Considering this monocular is a 10X model, that’s above the average’even when you factor in 8X monoculars along with the 10X models! The focus wheel lies atop the monocular, allowing easy one-handed operation. The focus wheel spins with just the right amount of resistance, allowing you to easily focus in on your subject without worrying about accidentally bumping the monocular off-focus. Bushnell makes the Legend Ultra HD in two colors, matte black and tactical sand. The body is rubber-armored, providing excellent protection against bumps and grinds, and the texturing is placed in just the right spots to allow a secure, slip-free grip on the monoc. A stainless steel belt clip is attached to the side of the monocular, so you can easily attach the monocular to your belt for quick access. There is also a Picatinny rail for mounting any type of accessory you might want to use along with your monocular, such as a high-powered tactical flashlight. The barrel of the Bushnell Legend Ultra HD is nitrogen-purged, so you don’t have to worry about fogging. The body is rubber-armored, providing excellent shock resistance in the event that you drop your monocular. I dropped mine out of a 25′ tree stand, and the monocular still works as good as new. Bushnell is so sure that the Legend Ultra HD will stand up to the rigors of outdoor use that they back it up with their Bulletproof 100% Money Back Guarantee, which gives you your entire purchase price back if you are unhappy with the monocular for any reason whatsoever. How Good Is the Bushnell Legend Ultra HD Monocular in the Field? That’s the crux of the matter, isn’t it? All of the technical details are pointless if the monocular fails to perform in the field. Not to worry, this monocular is as bulletproof as the guarantee Bushnell backs it with. I’ve used this on hunting trips, wildlife viewing hikes, and even for stargazing, and the monocular has never failed to exceed my expectations. This is truly one of the best-performing monoculars on the market. I had a groundhog problem on my property, and was struggling to spot the little varmints until I tried out this monocular. The level of detail I was able to pick out, even in the shadows of trees half a mile away, was nothing short of amazing, and I was finally able to spot the invading rodents so I could switch over to my rifle and end their pesky little lives! 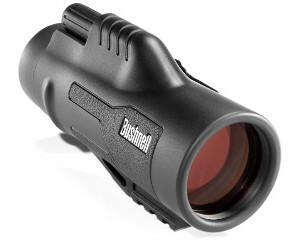 Thanks for reading this review of the Bushnell Legend Ultra HD Monocular. This is a top-quality product, and is backed by a rock-solid warranty and guarantee. The price is definitely less than what the quality of this monocular suggests it should be, so I unreservedly recommend this monocular for any long-range use, whether it's hunting, wildlife viewing, or casual stargazing. Hi and thanks for the great review of the Legend. I’m living in Mongolia and often leave the city and take trips to the countryside, with wide open plains lined by mountains a mile or two away on both sides of the paved road. Herds of yak, horses, camels, sheep etc roam throughout. Huge bald eagles, cranes and hawks gliding high up above. You get the picture. This is a wide open country like Montana. But much is at a distance. I don’t have the chance to view any of these models personally. I’m attracted to this model, but I’m a dental missionary on a modest budget and wondered if you agree this is definitely the best option. Or, perhaps you might suggest an alternative model. I’d appreciate your input.